The very first highway bridge made with Ductal® is the Shepherd's Gully Creek Bridge, 150 km north of Sydney, Australia. 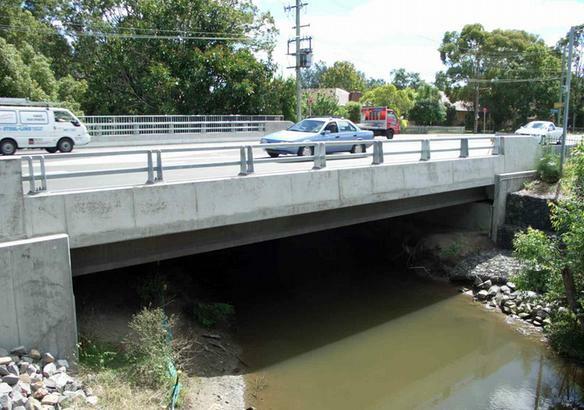 Built in 2002, to replace an old timber bridge, it spans 15 m x 21 m wide and features 16 Ductal® girders supporting a reinforced concrete slab that was poured directly into permanent formwork also made of Ductal®. The originality of this structure (studied and validated by the University of New South Wales) blends exceptional resistance to weather and traffic with a particularly light structure: 280 Kg/lineal meter for the girders and a thickness of only 25 mm for the permanent Ductal® formwork. Designed and built by VSL-Australia, the Shepherd's Gully Creek Bridge offers superior durability, resistance to the elements and minimal maintenance requirements.